As a rough guide, these English pronunciation podcasts are for Pre-Intermediate to Intermediate learners, but students of all levels will learn lots of new English words, and we’ve devised our tasks to help make this happen. These podcasts contain both British English pronunciation practice and American English pronunciation. We have selected vocabulary at Level 2 to help you work effectively towards the Cambridge Preliminary English Test (PET) as well as being very helpful for students beginning to work towards their Cambridge First Certificate in English (FCE) and IELTS exams. At Level 3 (Advanced) we help you make further progress towards your Cambridge First Certificate in English (FCE), IELTS and Cambridge Advanced English (CAE) exams. 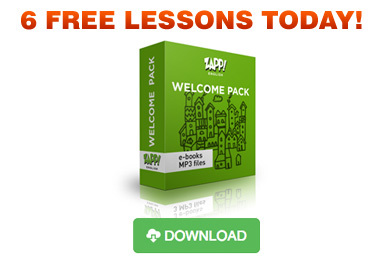 Start listening to our English Pronunciation Audio Lessons! As you listen to the audio, try and repeat the English words after Katie in the pronunciation sections. Zapp! English Vocabulary & Pronunciation Audio 2.5 – ☠ DANGER! !